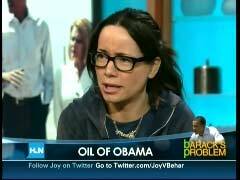 On Wednesday’s Joy Behar Show, HLN host Behar led a discussion of President Obama’s Address to the Nation with left-wing actress Janeane Garofalo and liberal commentator Ron Reagan, all of whom had some criticisms for President Obama regarding the BP oil spill and his speech on the subject. Garofalo started off complaining that "the prayer thing he did was pandering and anti-intellectual and just sort of a waste of time." After Behar pointed out that Obama had placed some of the blame on Mineral Management Service members who were still in place from the Bush administration, Garofalo did not give Obama a pass: "Right, so why did he not take care of that when he got into office?" Reagan complained that his speech was "too little too late," and that "he`s a corporatist like all our other Presidents have been for a long, long time. That`s what`s being revealed here. Barack Obama is just as much a corporatist as George H.W. – or George W. Bush was." While Behar was generally more inclined to defend Obama, at one point even she asserted that President Obama’s failure to meet with the head of BP was "so Bush, Bush-like. It`s shocking that he`s behaving this way," prompting Garofalo to lament: "I don`t know who's giving him the worst advice in the world. I don`t know, I don`t know why this presidency has been as disappointing as it has been. I really feel like he`s being advised terribly." BEHAR: And who`s going to take the place? Who are we going to get instead of him? Some Sarah Palin clone, or she herself? It`ll be even worse. BEHAR: Isn`t that`s a scary thought? REAGAN: That`s the dilemma for liberals. That`s the dilemma for progressives and liberals is you get somebody worse if it's not Barack Obama, even though Barack Obama isn't doing what we want him to do. 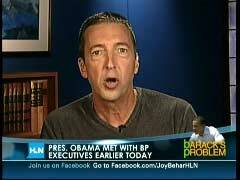 JOY BEHAR: President Obama appears to be doing everything he can to make sure Americans know that stopping the oil spill is his main priority. He met with BP executives today, and last night he delivered a speech on the disaster from the Oval Office. PRESIDENT BARACK OBAMA: But make no mistake. We will fight this spill with everything we`ve got for as long as it takes. We will make BP pay for the damage their company has caused, and we will do whatever is necessary to help the Gulf Coast and its people recover from this tragedy. BEHAR: Well, let`s just hope the next time Malia says, "Daddy, did you plug the hole?" she isn`t 47 years old. So was this speech enough to please his critics or did it just give them more material? Here with me to discuss this are Ron Reagan, liberal commentator, and actress and comedian Janeane Garofalo. ... Janeane, start with you, did you like the speech? JANEANE GAROFALO: No, I didn`t feel that it was a strong speech, and I felt that the prayer thing he did was pandering and anti-intellectual and just sort of a waste of time. BEHAR: Anti-intellectual? He’s considered, like, overly intellectual? GAROFALO: When politicians use that prayer stuff, it is anti-intellectual. It has nothing do with what has happened, it has nothing to do with any real way to solve a problem. You know, I felt this speech was not very effective. You know, fighting, fighting it with all that they`ve got, what would have been good is to undo the Bush policies that brought this. You know, Ken Salazar should not have been the Interior Secretary. That people from Mineral Management Services should not still have been able to work. BP has a terrible track record. It`s amazing that the Bush policies were allowed to still flourish, that the "drill, baby, drill" policy was still going. That any of these disasters could had been avoided because it wasn`t, it wasn`t unknown what could have gone wrong. BEHAR: Okay, well, he did blame a lot on the agency that was still in place. He did say that it was ineffective. GAROFALO: Right, so why did he not take care of that when he got into office? BEHAR: A good question. Ron, what do you think? RON REAGAN: Well, too little too late. I agree with Janeane, he did bring up the Mineral Management Services, of course, and that really is the crux of this, to me. You know, BP was doing what BP could be expected to do – cut corners, act recklessly, all in the name of profits. But Mineral Management Service, which was supposed to be regulating them and overseeing this, had fallen asleep on the job. Actually, that`s not even the right way to put it. Fallen asleep on the job suggests they actually wanted to do the job somehow in the first place, but they didn`t, of course because they`re all former or, you know, prospective oil company employees there. That`s the criminality here, it`s not just BP, it`s the MMS. BEHAR: Do you think it would have been any different if a Republican was in office now? Be the same thing or worse? GAROFALO: Oh, no, the exact same because these are these type of conservative anti-regulation policies and also all this kind of oil culture of oil cronyism. I’m not going to say that Democrats don`t partake in that. Obviously they do. But it might be worse if Bush was in office in maybe more hiding scientific facts or maybe they would do that thing they always say about no fingerprinting, now`s not the time for the blame. Yeah, they always say that. BEHAR: Yeah, yeah, yeah. Whenever they’re to blame. GAROFALO: But the policies are still the same unfortunately. GAROFALO: The same Bush policies that we`ve been laboring under have been continued. There is no reason why MMS has been allowed to thrive the way they have. There`s no reason Ken Salazar should be at the Department of the Interior, and there`s no reason that BP should still be doing what they`re doing right now as we speak with other rigs. BEHAR: The left is very hard on him, though, I think. The left is going very hard. Part of the frustration, I think, with, on the left and the right, probably is that he can`t fix it. He can`t do it. People say he should do it. What do they want him do? BEHAR: Isn`t he doing some of it? GAROFALO: I would hope so, but there should had been regulation. You know, I mean, there should had been regulatory reform as he came into office. BEHAR: When he came into office. BEHAR: Yeah. Why didn’t, Ron, why didn`t he do that? BEHAR: It`s kind of shocking in a way. It`s kind of shocking to me. REAGAN: Well, of course, but you can drill all that you want for oil on American territory, it goes into a global market. We`re going to sell it to China just as much as we`re going to sell it to, you know, American drivers here. There`s no such thing as American oil. It`s all fungible. It`s all global, so any dependence on oil is dependence on foreign oil. BEHAR: Well, he used the opportunity to bring up energy policy. Do you think that he was effective at all? Because I was a little disappointed in that. You know, we need alternative energy and there`s no question about it, and the American people are so lackadaisical about it that even now no one seems to see the urgency of the situation. GAROFALO: I think there’s many people who do see the urgency. They just aren’t given a forum to speak about it. There’s many people who are very concerned about this. There should have been clean energy reform made years and years ago. There`s many people who have tried to do this and because oil runs everything it keeps getting thwarted. There`s no reason why we shouldn`t have more clean energy and more reform in that area, too. It`s just, it`s one of those things it just keeps business as usual, it just keeps going and going and going. BEHAR: I know. Well, he met with BP men today. Ron, do you think that he kicked their butts today at all? REAGAN: -but who says when the people actually get the money? There are people that are still waiting for a payoff from the Exxon Valdez, you know, I mean, you know, just because there`s money in a fund doesn`t mean it`s actually going to be going to people. I will imagine that BP will litigate every claim. BEHAR: He said, originally he didn`t want to meet with them because he didn`t want to hear their talking points. That is so Bush, Bush-like. It`s shocking that he`s behaving this way certainly. GAROFALO: I don`t know who’s giving him the worst advice in the world. I don`t know, I don`t know why this presidency has been as disappointing as it has been. I really feel like he`s being advised terribly. Now, there`s the critics that will always criticize him and I don`t think it`s even valid to entertain the Tea Party kind of nonsense and also they don`t like government, now they want government to intervene in this. BEHAR: Oh, I know, there’s hypocrisy. GAROFALO: So the hypocrisy of some of his critics is not even really worth discussing. BEHAR: And also what scares me, too, is that, you know, he`s getting attacked from the left and the right. He`s really being attacked, I think, a lot. And who`s going to take the place? Who are we going to get instead of him? Some Sarah Palin clone, or she herself? It`ll be even worse. GAROFALO: Well, there`s a difference between attacking and criticizing. REAGAN: That`s the dilemma for liberals. That`s the dilemma for progressives and liberals is you get somebody worse if it’s not Barack Obama, even though Barack Obama isn’t doing what we want him to do. BEHAR: So what are we suppose to do about it? REAGAN: What do we do about it? Keep lighting a fire under him, you know, keep doing what we`re doing, talking about this. It’s all we can do really. GAROFALO: And we need media reform. I think media reform is important, that people really do get full, fair information and more news about what`s going on and more transparency. BEHAR: How much more news do we need? Every station is news. GAROFALO: Oh, yeah, but it`s not good, it`s not well presented. There`s not context and history and nuance and complexity. They have all this "he said she said" nonsense, as if there’s two sides to every story which there isn`t. It would be great if these news sources told the truth once in a while. That would be interesting. BEHAR: Well, we try to do our best here. GAROFALO: Yeah, you guys are good, you got that Miley Cyrus thing all wrapped up. BEHAR, LAUGHING: Okay, you won`t be back. Thanks a lot.